BSL users are able to submit to the Work & Pensions a Select Committee inquiry in BSL. The deadline for BSL submissions is Friday 1st August. This is just to help parliament prepare for the number of translations needed. There seems to be a lot of confusion around at the moment due to the two pieces of work being undertaken by government in regards to Access to Work. There is still a lack of clarify around the DWP review and what it will involve (e.g. will it be a public consultation or an internal review). If the review is made over the summer (as expected), then we presume it will be completed by the end of September, however this has yet to be announced. The Committee inquiry is separate from the DWP review. The Committee’s inquiry will be different; it will be far broader, looking at all aspects of the operation of AtW, not just those which impact on deaf people. It will take longer to complete, reporting later in the year (approximately November time). Committee reports make recommendations to the Government. The Government is not obliged to accept the Committee’s recommendations but is expected to respond within two months. As it is not certain whether or not a consultation will happen as part of the DWP review, it is important you submit to the inquiry. This could be the only chance you have to feedback your experiences. There are just 8 days left to submit evidence to the inquiry. Ministerial Statement – issued today. The Minister for Disabled People (Mike Penning MP): Access to Work helps over 30,000 disabled people to take up and remain in employment each year, providing support such as specialist aids and equipment, travel to work and support workers. This Government has expanded and strengthened this important programme by increasing the budget and implementing a wide range of improvements. As a result, volumes and expenditure on Access to Work have increased over recent years, meaning more disabled people are now being supported to fulfil their potential in the workplace. This progress has been shaped by important reviews undertaken by Liz Sayce and an Expert Panel chaired by Mike Adams. I want to continue to build on this success so that Access to Work can support more claimants per year. That is why I have asked that over a three month period, we now look into Access to Work, focusing on how we can support more disabled people and further improve customer service. I will set out further details on next steps shortly. Whilst we undertake this work I am also suspending Access to Work’s 30-hour guidance for new claimants. This operational guidance stated that if a Support Worker is required full-time, for example 30 hours or more a week, Access to Work will normally provide funding on the basis of an annual salary rather than a freelance rate. Having listened to concerns about its practical effect, notably on the ability of some deaf customers to source appropriate British Sign Language support, this guidance will not be applied to new cases pending the completion of this work. You only have 10 days remaining. For more information, see our previous posts, or go to the governments website and view details of the inquiry here. The Stop Changes to Access to Work will be making a written submission, but the more voices that are being heard, the more chance there is that we will be listened to. It is because of your campaigning that any of this is happening, so please don’t waste the opportunity to have your say. 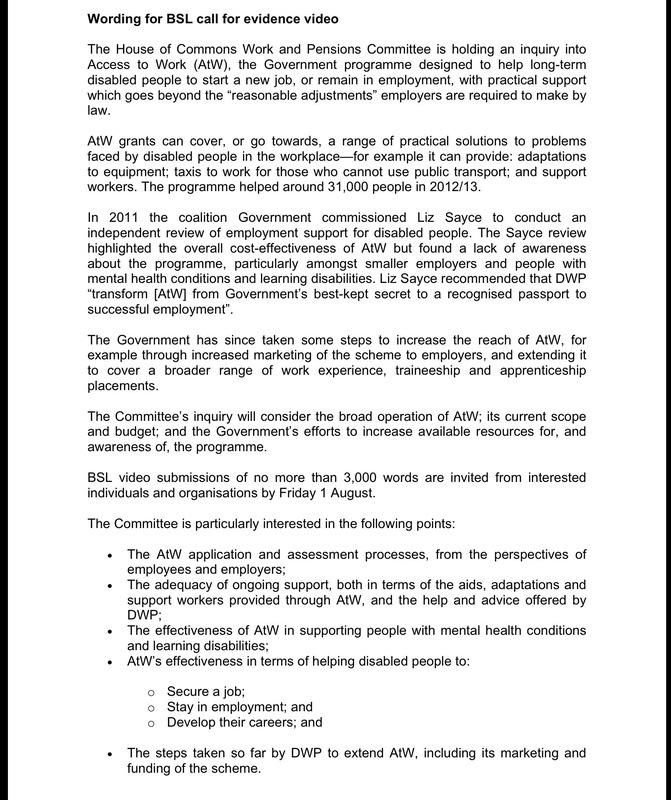 We fully recognise that the inquiry into Access to Work is currently not accessible to BSL users, however this is being looked into and as soon as more information is available, we will let you know. Information can be found on http://www.deafatw.com too, so please keep checking this. DeafAtW now has BSL clips and is regularly updated. 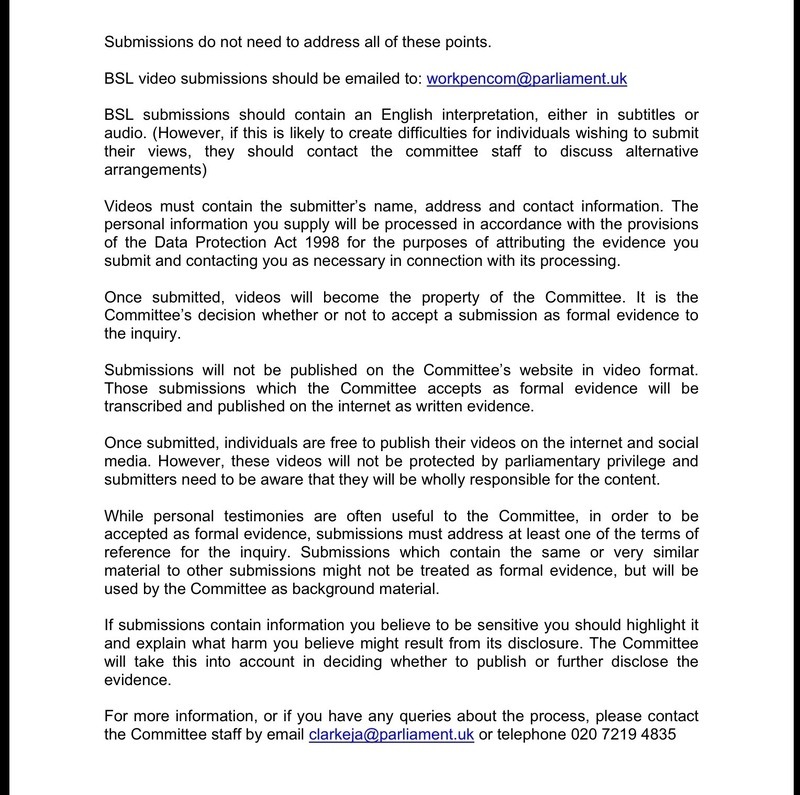 To submit written evidence to any select committee inquiry, there are guidelines that you need to follow. These can be found here. * be in Word or Rich Text format (not PDF) with as little use of colour or logos as possible. It would be helpful, for Data Protection purposes, if individuals submitting written evidence would send their contact details separately in a covering email in a block of text laid out vertically. You should also be aware that there may be circumstances in which the House of Commons will be required to communicate information to third parties on request, in order to comply with its obligations under the Freedom of Information Act 2000. The website contains further information that we would recommend reading.